Piecing It All Together: Help Us Cross the Campaign Finish Line! Download a PDF of Almanac, March 2019 (Number 97) here. 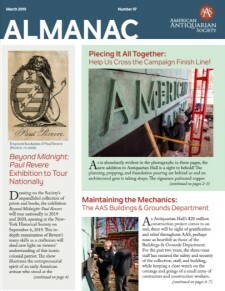 Almanac, a newsletter for members and friends of AAS, is published twice annually in spring/summer and fall/winter. Its purpose is to publish news and feature stories regarding the collections, those who use the library, and members of the Society. Subscriptions to Almanac are available at no charge to members and friends of the American Antiquarian Society. New subscribers should email a postal address for a paper copy or an e-mail address for an electronic copy to Kayla Hopper at khopper@mwa.org. Back issues of Almanac through 2001 are available as pdfs.